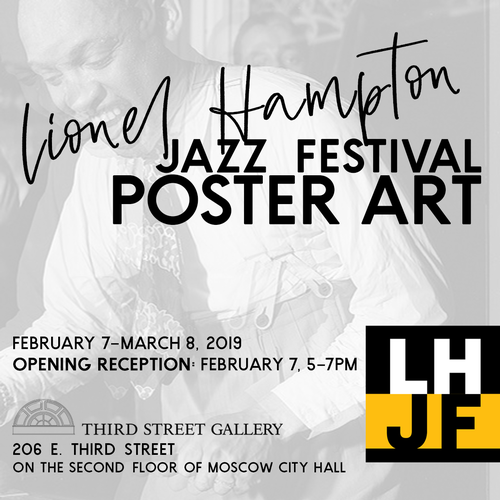 The opening reception for the Third Street Gallery exhibit titled: “Lionel Hampton Jazz Festival Poster Art” will be held on Thursday, February 7 from 5:00pm to 7:00pm. Join us for an evening celebrating the artworks of the University of Idaho’s Lionel Hampton Jazz Festival with an exhibition of posters from 1985-2008, as well as the unveiling of the 2019 Festival poster. The Palouse Jazz Project will provide live music starting at 5:00 p.m. and light refreshments and a cash bar will be provided by Bloom. UI student Abigail Spence will share her process of creating this year’s poster beginning at 6:00 p.m. followed by a presentation by Josh Skinner, Managing Director of the University of Idaho’s Lionel Hampton Jazz Festival. Reception sponsored by Appearances Marketing and Promotion with graphic design by Erica Wagner. The exhibit runs through Friday, March 8.